Dur-Red Products Smoke Hatches have been tested and approved by Underwriters Laboratories, Inc., made in accordance with their regulations, and evolved as a result of their investigations. The doors are equipped with an automatic device, which at a temperature of approximately 165º F. causes the fusing of a link located at the center of the two doors; torsion spring drives then cause the doors to open by compulsory force; shock absorbers are installed to control the speed of the door as it travels open. The automatic device can be easily re-set, and a new link inserted, without removing or dismantling the doors. **Doors may be manually opened from the inside of outside by a handle; depending upon the type and application. These units, specify by Model No. _______________ Smoke Hatch, have a 14 gauge G.I. 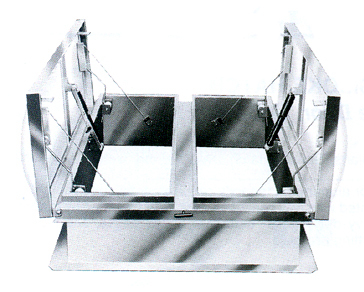 curb and curb frame fully welded and ground smooth for absolute weather tightness; lids shall be of 11 gauge aluminum; completely assembled with "heavy-duty" aluminum 3/16" pivot hinges. Lid to have fiberglass insulation. Painted with two coats of G66S13 primer.